It is estimated that there are 450 billionaires and 3,000,000 millionaires in United States (more than 60% are Jewish) as per 2008. The net worth of all households in US (population aound 300 million) as per June 30, 2008 – was US$56 trillion. The 450 billionaires are worth US$1 trillion, while 3,000,000 millionairs are worth US$11 trillion – which comes to one percent of US population owning more than 21 per cent of countries resorces. Most of these billionaires and millionaires have accumulated their wealth by managing fellow Americans’ money or looting the resources of under-develope nations – mostly Muslims. On Global level – Americans are less than 6 percent of world population – but consumes more than 40 percent of world’s resources and produce more than 50 percent of world’s garbage. In the US, the real estate rose 50 per cent between 2002-2007, while the mortgage dept rose 75 percent during the same period. Consumers’ debt rose by 30 percent, while durable goods assests have only risen 24 percent – and financial assests rose to staggering 55 percent. The vast majority of this financial assest growth benefitted the billioniares and the millionaires. International monetary system (WB, IMF, WTO, USAID, etc.) 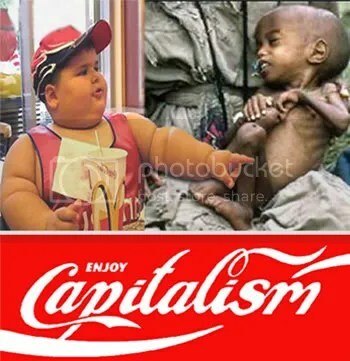 is based on Capitalism- and is maintained by the super-powers for the benefit of their minority rich elites – which was the driving force behind western colonization of most of Asian and African nations. These greedy and corrupt elites feel no mercy for their own countrymen either. Their controlled governments always are there to bail then out by using taxpayers’ hard earned money. Recently, America’s largest bank, Washington Mutual, collapsed – and shareholder lost US$80 billion plus US$200 billion in bad assets (?). The world’s largest insurance company, A.I.G Insurance (owned by Zionist Jew, Maurice R. Greenberg), which has posted a loss of US$1,500 billion. Then there is the Jewish financial group, Lehman Brothers, whose stocks went from US$85 down to $.21 cents. The company declared a loss of US$500 as result of stock loss, account payable, debt and other liabilities. Let’s not forget Westfield, which is owned by a Zionist Jewish family, Lowy, was charged for hiding US$68 million in foreign accounts to avoid paying taxes in the US. Now Bush Zionist administration has proposed a US$700 billion package from taxpayers’ money – to bail-out these crook billionaires and millionaires at Wall Street. Interestingly, the same Bush government doesn’t have enough money to help 45 million US senior citizen, who cannot afford necessary medicare or educate those 54 million Americans who cannot read or write or more than one million homeless Americans. Capitalism is based on Usury, which is a great sin in Islam. Islam hold the view that economic disorder is not the cause of a nation’s miseries – but the result of nation’s moral degradation. Character building and development of moral health are the only remedies humanity is in need of – Without which social, political, economic or any other reform is just waste of time – as proven by both Capitalist and Communist dogmas. Islam is not against material progress, but it has to be controlled by Islamic morality – otherwise mere material progress will lead to disastrous results, as seen in the western societies. Jim Quinn wrote a very informative article is worth reading.